The North's withdrawal from the office was another blow to Moon, who has seen his standing as a mediator between Pyongyang and Washington deteriorate and divisions grow within his government over how to break the impasse. 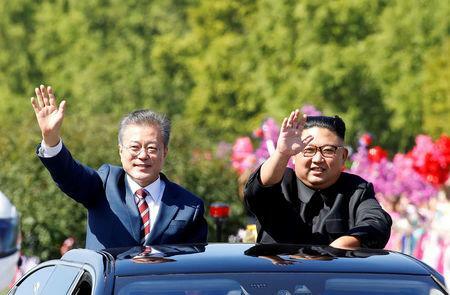 Moon's administration had touted the office as a major feat resulting from his own summit with Kim last year despite U.S. concerns about possible loosening of sanctions. The South's Chun said he would not directly link the North's move to the failed Hanoi summit. But experts saw a pattern in the North lashing out against the South when its crucial strategic position with Washington is in jeopardy. "The North sees its nuclear issue and ties with the United States as a matter of greater strategic importance, so when they try to assert its position, they sacrifice the ties with the South, which is considered inferior," said Shin Beom-chul of the Asan Institute for Policy Studies in Seoul. Moon's office reacted by holding an urgent meeting, headed by his national security adviser, to discuss the withdrawal. The latest sanctions showed there was some "leakage" in North Korea sanctions enforcement by China, but it was mostly abiding by U.N. resolutions, a senior U.S. official told reporters on condition of anonymity. U.S.-North Korean engagement has appeared to be in limbo since the Feb. 27-28 summit, despite U.S. Secretary of State Mike Pompeo saying on March 4 he was hopeful he could send a team to North Korea "in the next couple of weeks." Activity was detected at the North's main rocket test facility around the time of the failed summit, fueling concern that Pyongyang may be about to resume weapons development to ratchet up pressure on Washington.